All photography is, basically, a two dimensional projection of a three dimensional reality. Until that moment when three dimensional photo printing is developed, it remains a constant challenge to convey the same sense of depth and perspective in one’s photos as one sees with his/her eyes. It is a hard ask no doubt, but photographers have been relying on a technique for decades to overcome this challenge. They have been using basic lines and shapes in there photos to capture the essence of a three dimensional subject on a two dimensional photo. The easiest way to convey a sense of depth in your photos is to incorporate not one but two sets of lines, parallel lines to be precise. Look at the image above. 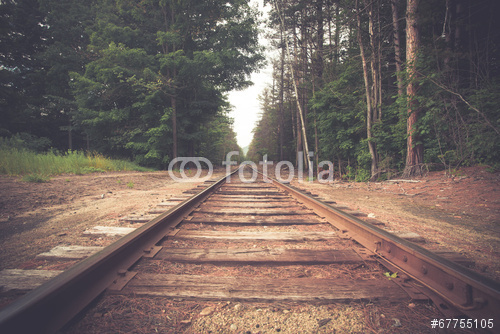 See how the converging lines of train tracks creates a sense of depth in the image. Also care should be given to the direction of the line in your image as it can influence viewer’s emotions. The above image with the converging lines, a classic example of linear distortion, is not the most peaceful of images though. The fact that the tree line at the far end making a mirror image of the converging lines below and thus appear to be like two sets of triangles converging injects a sense of further tension in the image. On the other hand, the above image, a classic demonstration of sunrise / seascape. Evoques a sense of warmth and peace. For ages a flat line has been widely acknowledged as a mark of calm state of things. The line referred to above, is the horizon-line. Thus, a sea with a straight horizon line gives a feeling of peace. An angled horizon line induces a state of fear, power, devastation or even imminent danger. This simple yet effective trick has been used not just in nature photography but also in urban cityscapes to introduce tension and a dynamic composition. So, what is the relationship between lines and perspective in photography? Ok let’s come back to the point where we started this discussion and put to practice what we have learnt here. Diagonal lines or lines that are converging when used in tandem with a wide angle lens from a low angle can give a better and more emphasized view of the landscape. Try it out yourself next time, and see the difference in your photos. Sometimes lines are easy to spot. They are obvious and just waits to be incorporated into your photos. The above two examples of lines in nature would be cases in point. At other times, however, the existence of lines in nature or in your immediate urban environment may not be as easy to spot. But then a slight hint of a line can also be an interesting way to define dimension and depth in your photos. Can you see the line in this photo below? Or may be in the one below? In both the images lines can be difficult to spot for the untrained eye. But then you should be able to find it in the end. First photo of the biker, line would be defined by the metal fence on the side of the road leading the viewer into the center of the image. While on the other hand, the second photo’s line is represented by the alignment of boats in a harbor and leading the viewer towards the edge of the image (and in this case pointing to the sun setting). How the convergence of lines can themselves make the subject of a photo? The beauty about converging lines is that the point where the lines seemingly meet, immediately draw the attention of the viewer. In the following example lines drawn from every direction converge at the center creating a powerful image. The focal point of this image is the circle that seems to be the destination for all the lines across the frame. It can easily be demonstrated as a something that is divine, a symbol of everything around us that carries a symbol of god’s handiwork. It is a very powerful image. The image is also a good example of rule of thirds, a basic compositional technique that enhances the quality of an image (intersection of lines is occurring on the upper point of interest). Lines are not limited to landscapes, cityscapes and /or street photography but they can also be used in portraiture to lead the viewer into your subject. Master photographers like Henri Cartier-Bresson for example have used lines in their photography as a powerful tool for drawing the viewer’s eye. One of the more famous examples is that of the image of a couple shot inside a train in Romania. Watch how the window frame was integrated into the composition and pointing toward the couple. Or the legs of the subject used as a foreground element to lead the eye to the center of the image. If you want examples of how lines can draw a viewer into an image, try studying that photo below. It would be a fun exercise to actually spot the lines.